Winnie's Inky Fingers: Let Freedom Ring! Happy Flag Day! Let Freedom Ring! Happy Flag Day! 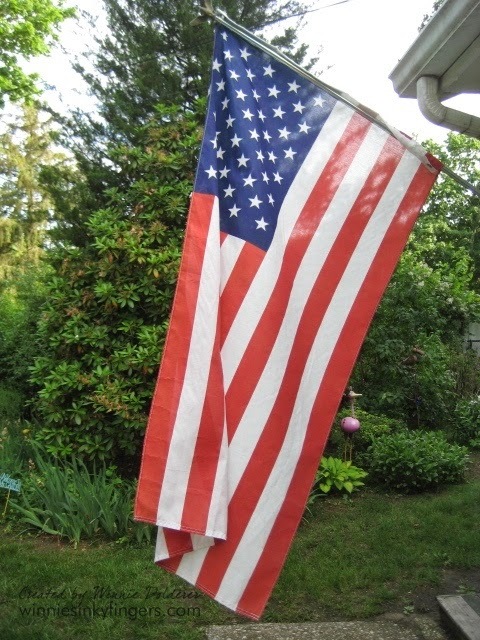 Today is Flag Day here in the U.S.! You may remember if you have been following my blog a while that each year I make my sister a card for Flag Day. It started years ago when she made a comment that I make cards for ANY reason, that I would even make one for Flag Day. Well, my late husband reminded me of her comment, and from then on she gets a card on this day. This year is the 10th year I am sending her one. In all seriousness, there is nothing more beautiful that seeing our flag hung and waving in the breeze. Thank you to all who gave so much for us to be so lucky to live in freedom. All you have to do is turn on the news and hear about so many that aren't as fortunate, and I thank my lucky stars for Old Glory. If you live in the U.S. I hope you will join us in hanging your flag! Happy Flag Day - we made sure to put our flag out early this morning. 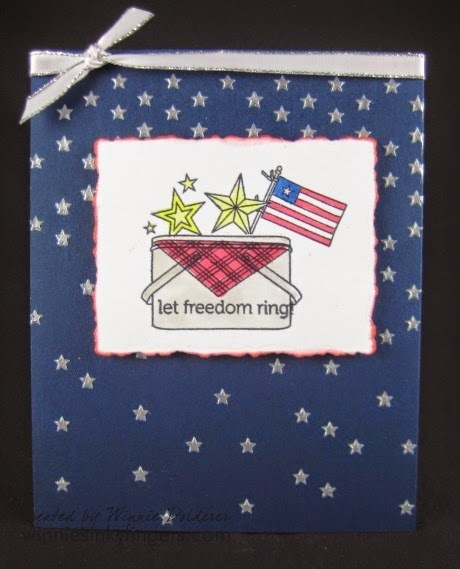 I just adore patriotic holidays, and this card is such a great example of the your love of America and your long-time tradition to your friend. LOVE it! As a child growing up in a military family and a brother still serving, your post LITERALLY brought tears to my eyes - but happy tears :) Indeed these are colors most divine and say so much! I have ours out flying as well - beautiful card, beautiful tribute to your sister, too - 10 years later! (and good thing you didn't say something like toilet paper, ROFL!) Hugs!! How beautiful, Winnie. How talented you are. So happy you celebrate Flag Day.